SAN FRANCISCO (AP) — San Francisco’s new sheriff used his swearing-in ceremony Sunday to speak publicly for the first time about allegations that he was involved in a domestic abuse incident. Former city supervisor Ross Mirkarimi took the oath of office at the city’s War Memorial Veterans Building with his wife, Eliana Lopez, smiling at his side and holding their young child. He was sworn in by a former San Francisco mayor after a judge declined to administer the oath. Mirkarimi denied that he had ever abused his wife, but acknowledged the controversy he’s involved in as he takes over as the city’s first new sheriff in more than 30 years. “I am sorry that a cloud hangs over what should be a very special day,” he said. His wife also spoke, denying that she had ever been physical abused. “I don’t have any complaints against my husband,” she said. The San Francisco judge who was set to administer the oath during Sunday’s event declined to do so. 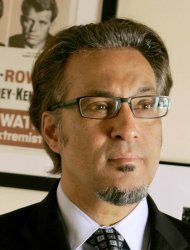 In an email to the San Francisco Chronicle (http://bit.ly/xbbi16), Superior Court Judge Katherine Feinstein said she didn’t want to create a potential future legal conflict should a case involving Mirkarimi be brought to her court. Feinstein is the daughter of U.S. Sen. Dianne Feinstein. Instead, former San Francisco Mayor Art Agnos administered the oath. Mirkarimi is under investigation over allegations that he was involved in a domestic violence incident with his wife, a charge she also denied last week. According to a police affidavit, a neighbor of the couple said Lopez told her she sustained a bruise on her upper right arm when Mirkarimi grabbed her on New Year’s Eve. Ivory Madison also told police she videotaped the injury at the request of Lopez and exchanged text messages with her about the alleged domestic violence, the affidavit said. San Francisco police turned over their findings to the San Francisco District Attorney’s Office late Friday, police spokesman Albie Esparza said. Officials in the DA’s office did not immediately respond to requests for comment Sunday. PHOENIX (AP) — A sheriff’s deputy was shot and killed while answering a burglary call in the north Phoenix community of Anthem early Sunday, and other deputies shot the suspect, Maricopa County Sheriff Joe Arpaio said. Deputy William Coleman, 50, and his partner found a suspect in a van with a pit bull dog at a medical building at about 4 a.m., Arpaio said. The man got out of the van and opened fire with a rifle, striking Coleman under his bulletproof vest. The deputy was taken to a hospital but doctors could not save him. It isn’t clear if Coleman was able to return fire, but other deputies eventually shot and killed the suspect, Arpaio said. The dog was calm and was taken to a sheriff’s animal shelter. Arpaio said investigators were trying to figure out why the 40-year-old man opened fire. Coleman was a 20-year veteran. He is survived by a wife and two young children, ages 4 and 7, Arpaio said. He also has grown children in another state. 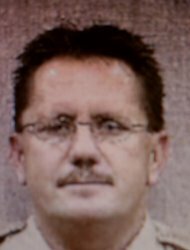 Coleman was assigned as a patrol deputy but had previously worked the sheriff’s lake patrol unit. Last year was one of the deadliest in recent history for law enforcement officers, with 173 killed in the line of duty as of Dec. 28, a 13 percent increase from 2010, according to the National Law Enforcement Officers Memorial Fund. Of those, 68 federal, state and local officers were killed by gunfire in 2011, a 15 percent jump from the year before. “There seems to be a war on cops across the nation, and here in Arizona,” Arpaio said Sunday. MADISON, Wis. (AP) — A Madison man with an unusual name is in jail after police said he violated his bail conditions from a previous run-in with the law. Thirty-year-old Beezow Doo-Doo Zopittybop-Bop-Bop is tentatively charged with carrying a concealed knife, possession of drug paraphernalia, possession of marijuana and a probation violation after his arrest Thursday. He remained in jail as of Sunday. Jail records don’t list a bail amount or an attorney for him. The Capital Times reports (http://bit.ly/z7IOdM) he was arrested after residents complained of excessive drinking and drug use near Reynolds Park. Court records show his previous name was Jeffrey Drew Wilschke, and he legally changed it to Beezow Doo-Doo Zopittybop-Bop-Bop in October. He was arrested in another Madison park last April after police found a loaded handgun in his backpack.